“Selfie Saturday” is kind of a thing on Instagram. It certainly hasn’t achieved the ubiquity of #throwbackthursday or anything, but I’ve been known to post a gratuitous and appropriately-hashtagged weekend selfie on occasion. I thought that today I’d participate, but in a way to allows me to discuss my own lifelong issues with my body and self-image. I started this blog to post my recipes & interior decoration, but since I work and take a summer class, I haven’t really had the time to make good on that mission statement. 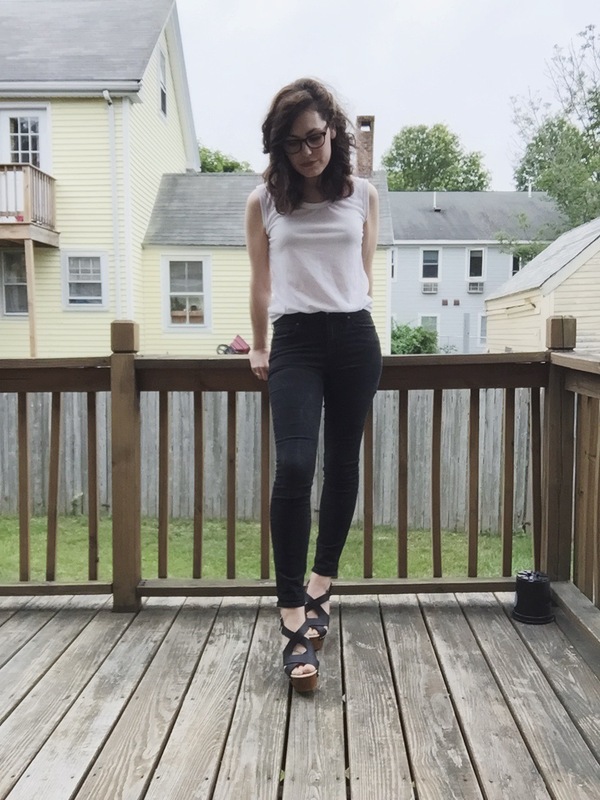 These outfit posts have been a low-maintenance way for me to practice using the WordPress interface and to get into the habit of sharing my life. Sharing requires both vulnerability and honesty, and I don’t think I could continue to post pictures of myself in good conscience without revealing that they are a celebration. Even a year ago, I wouldn’t have had the confidence to make images of my body public. 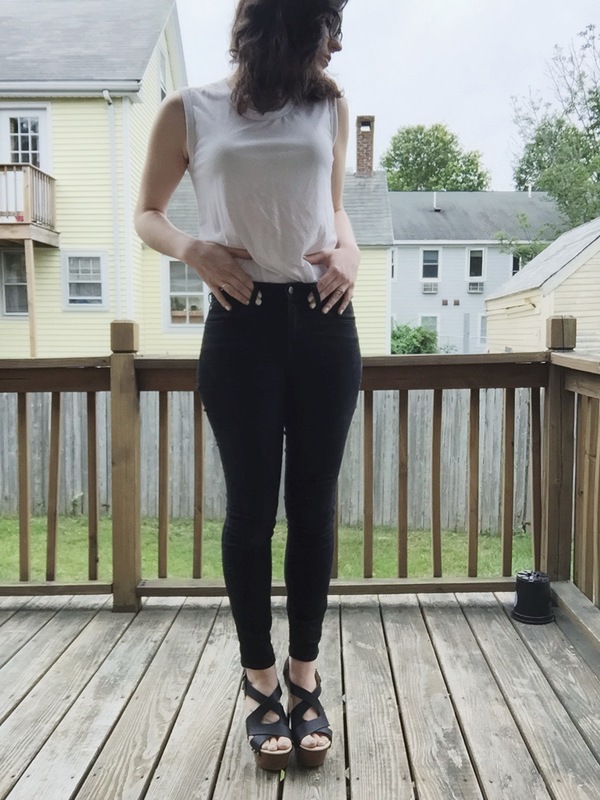 I have recently lost weight—not much, but enough that clothes have begun to fit me differently and I feel healthier and more secure. The first time I could button a pair of size 4 pants, I nearly died of incredulity. I have never, by definition, been overweight, but I have carried anywhere between 10 to 20 extra pounds of weight like a security blanket for years. Finally, though, I was able to settle into a routine of activity and eating that my body responded to positively. I also began taking anti-depressants, which seem to only have aided me in my body’s process of finding its equilibrium. I struggle with the fact that I feel so much better thinner, because I have battled various eating issues my whole life, and my way to cope was to embrace body positivity. I’m finally at home in my own skin, because my body has found a weight that is healthy for it. Not because I’m “skinny”. However, there’s a certain guilt that comes with that. I almost feel disallowed from having insecurities. But I also won’t apologize for letting myself love my body. The goal of body positivity is to get to a place where you love yourself and don’t dwell on self-loathing and criticism fostered by socially-constructed ideas of beauty. It’s hard out here for girls, even if they *do* fall within the parameters of Western ideals of beauty. But that’s another topic for another post. These pictures, these clothes I never thought I’d wear—they celebrate me letting go of more than a decade of negative thoughts. It feels so great not to feel shame. top/Gap, pants/Gap, shoes/ZIGIsoho Just a simple work outfit. I wore Keds instead of platforms earlier though (like a normal person). You’re so sweet! I checked out your blog and will definitely be following!